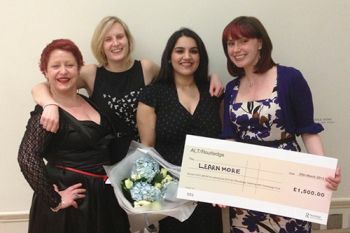 The Association of Law Teachers has awarded the inaugural Teaching with Technology Award to The City Law School's Learnmore website. The prize was established to recognise, reward and champion innovation in teaching and learning. Organisers commented that "the standard of entries had been exceptionally high and showcased the high-quality of law teaching in the UK". "I am delighted to congratulate Emily and Sanmeet on their win, their fabulous website, and their inspirational commitment to student learning. Projects such as Learnmore really showcase the possibilities for innovation, using technology in a thoughtful and engaged way that builds on collaboration with and feedback from students to create resources that will help them to succeed." Learnmore is a collection of multimedia law tutorials which offer advice on everything from mooting, to law reports, to pupillage interviews. It was one of just three entries selected to make a presentation at the ALT Conference in Nottingham. Judges commended the way the site engages proactively with students using IT to provide accessible support which directly relates to their needs. There were also positive comments about this being an openly available resource. "We are really honoured to receive this award and particularly pleased that so many external institutions have recognised the value in using and recommending Learnmore to their students. We would like to acknowledge the contributions of our students who feature in our videos and write posts for us. It's been great to have such an overwhelmingly positive response to this part of Lawbore. This award gives us further motivation to continue to improve the resource for students and we are already developing a legal writing tool for the new academic year". Entries for the Routledge and ALT award were considered under a number of criteria including: demonstrating that the use of technology had improved student engagement and performance; showing the technology has influenced and enhanced learning and pioneering the use of technology within the context of a research study.